New home improvement tax: On top of new banding, the report recommends not just a council tax revaluation, but regular revaluations (p.240). The council tax revaluation will mean Gordon Brown’s inspectors, the Valuation Office Agency, will inspect, photograph and catalogue every home, and every sign of a nice neighbourhood. Council tax bills will rise purely for living in a quiet road, being near to a bus stop, or having a parking space. People who rent will be taxed just as much as those who own their home. Inspectors have the right to enter people’s homes, on pain of £500 fines. Unlike at present, council tax will effectively become a home improvement tax. New death taxes: Pensioners face the prospect of being pressured to sign away their homes’ equity to local government tax collectors (p.259). Town halls will encourage pensioners to ‘defer’ their local tax bills, and instead pay - with interest - when they their property is sold or on death of the surviving resident spouse. Such a policy though will pressure many pensioners on fixed incomes to sign away their equity if they are struggling with their tax bills. A typical pensioner in England will face a net debt of £64,000 after 20 years. New bin taxes: Town halls will charge new bin taxes to collect household rubbish (p.280). Microchips will be installed on compulsory wheelie bin and new municipal bin inspectors will police every bin. The taxes will damage the environment and public health by causing a surge in fly-tipping and backyard burning. Based on Ireland, the charges will be £451 per year to collect 2 bin bags a week. New bed taxes: Town halls will be able to levy new bed taxes top of existing business rates and VAT on hotel bills (p.316). Based on similar taxes in other countries, this could potentially add £100 a week to the cost of a family holiday or visit to Britain’s tourist destinations. Less well-off families will be the hardest hit. People will be punished for going green and holidaying in Britain. “Gordon Brown’s town hall tax report has dropped a tax bombshell on working families and pensioners across the country. The green light has been given to intrusive and expensive inspections of family homes. Nice neighbourhoods and the rising value of homes will all mean higher council tax bills. Regular revaluations will turn council tax into a home improvement tax – taxing your patio, your conservatory and garden. I fear the elderly, struggling with soaring council tax bills, will be pressured into signing away their homes to the taxman. Vulnerable people face either forfeiting their children’s inheritance or have the bailiff knocking on their doors for non-payment of rising council taxes. Every household faces the prospect of new rubbish taxes on top, combined with their bins only being collected once a fortnight. If you don’t pay, your bins just won’t be collected. These taxes will lead to a surge in fly-tipping and dangerous backyard burning. It will have devastating consequences for the local environment and public health. This isn’t a green tax – it’s an excuse to tax more by stealth. Central Office at its best. Does the Conservative Party believe that the level of council tax should continue to be based on the relative value of homes on 1st March 1991, for ever and ever and never be revalued? If so, why? There are systems in the US of charging 1% Market Value each year with a 75% deduction for owner-occupation...Texas operated a Homestead exemption of 75% on the assessment. The idea of "deferring" council tax into a new death tax, plus interest, is particularly pernicious. This is essentially an excuse for increasing council tax way above the level ordinary people can pay. The Councils will try to claim deferment is a reasonable and helpful alternative, when actually it is simply giving the taxman an even bigger shovel to dig into your finances with. Tax them til the pips squeak and then offer them more tax dressed up as a helping hand. As for the bin tax, what are our current rates for? If we're going to horsetrade o services and taxes can I pay less tax and have my schools cut off? It's hardly going to encourage people to holiday in Britain (whether you want to encourage it for economic or environmental benefit, take your pick) if they are going to have yet more tax adding to the cost of British hotels. I'm sure there are many more appalling taxes in the murky depths of the budget. Bad, given the amount of pressure on on-street parking that currently exists. From a personal perspective,bad. I live in a shared house (split into bedsits) in the city centre. We share a bin. 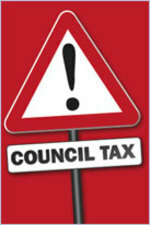 Current council tax is paid by the landlord. How would we work this scheme? Plus the potential for dumping rubbish in neighbours bins in town house areas especially. "Conservatives will fight hard against these tax plans and stand up for working families and pensioners who deserve better." Well, that's a start, Caroline, but I think the words we were really looking for were: "we will repeal this legislation and reverse these measures as soon as we are in government, and following on from this it will be our primary goal to bring the burden of council tax down." How about it? You're looking at the widest of open goals here - whatever you do, don't fumble your shot or put the ball over the bar. These proposals are an OUTRAGE. Penalising people for making their neighbourhoods nicer is monumentally stupid, and typical of the brutalist approach of New Labour. I am fed up with people's home being treated as just another financial asset. A lot of people of modest income have acquired good houses through sensible management of their funds. They are more than just bricks and mortar, they are homes. Obviously the poll tax was a disaster, but I for one am sick to death of the extent of progressive taxation. Why should I have to pay more for council services than some feckless glue-sniffing lout? And why on EARTH have we allowed councils to tax us so much anyway?! One of the only things they do of any merit is clear away our bins, and now they want to charge us extra for that. Just take away our rubbish you idle sods, and if you want to recycle some of it, you can go through it yourselves. It is a massive flaw in the Conservative Party's strategy that they want to give more power to local councils. Far too many councillors are halfwitted and corrupt. 'Oooh, let's devolve healthcare.' Let's not. Everyone wants an A & E department near them, not an aromatherapy centre. I do think that Caroline Spelman's response is rather unintelligent. The "tax bombshell" would have been if the report had recommended a local income tax. David Boothroyd is right - any property tax requires regular revaluation which inevitably means that improvements and whether the area has improved etc will be taken into account because they will be reflected in the value of the property. A revaluation no less than once every 10 years should be statutory to stop governments putting it off and storing up more problems. The deferral of the tax for pensioners is also not a bad idea provided the interest charged is low and controlled and also perhaps it should be combined with a reduction for pensioners such as we proposed at the last election. There are fair points to make against both the bins and beds taxes but Mrs Spelman will drown them out with hyperbole if she does not watch it. We should have welcomed the recognition that a property tax has a place balancing other taxes but said that we had issues with some of the details; and would come up with our own thought-out proposals in due course. In the latter category, one thing we should consider is for banding to reflect regional variations. A top band of £1m plus in London means a very different type of property to such a top band in, say, the north of England. Otherwise the introduction of higher bands will just be yet another thinly disguised way of fleecing more tax out of Londoners to spend in other parts of the country. With that safeguard, provided the proportionality is reasonable, and in combination with measures helping pensioners, I do not even object in principle to the proposal for more bands. All good stuff (from CCHQ) apart from the objection to the bin tax - why? Why shouldn't people be charged according to the service they use? If local people object to their council building a waste incinerator and instead demand they opt for the more expensive recycling (or soon to be more expensive landfill) why shouldn't they see what effect that has on their bills more clearly? If people don't want to sort their waste, and just dump it all in the 'black bag' why shouldn't they pay more for the privilege? "Town halls will encourage pensioners to ‘defer’ their local tax bills, and instead pay - with interest - when they their property is sold"
I completely agree with Comstock that this is not unreasonable. With the caveat that they ought to scrap Inheritance Tax as a quid pro quo. Another point in favour of the pensioner deferral proposal is that the debt will be knocked off the value of the estate so with a house of any value in the south, there will effectively be 40% relief so long as there is Inheritance Tax. Alternatively, if the latter were abolished over a few years (as would be my desire), then estates would often benefit from its abolition by more than any Council Tax debt that could have been built up. So a reasonable quid pro quo. If those standing to inherit don't like the interest being paid they can always pay the Council Tax for their old folk themselves - come to think of it, if this is recorded as a proper debt then one could even get 40% IHT relief on it now. Can we start from first principles and ask why councils should be given all this money in the first place? What do they do that can't be done better by private enterprise or central government? We should be looking to make local (and central) government much smaller. Many of us pay far, far, far too much tax. Another reason I don't support localism is that I don't believe central govenment will shrink proportionately if local government expands. All the evidence suggests that we'd just have an even bigger layer of government. "Does the Conservative Party believe that the level of council tax should continue to be based on the relative value of homes on 1st March 1991, for ever and ever and never be revalued?" Curiously enough, in Ireland they've never got around to revaluing for rating purposes since 1920. I find the idea of an inspector being able to barge into your house pretty alarming. Whatever happened to privacy. Although my previous post "crossed" with his, glad to see that Mark W and I are leading an emerging Conservative Party consensus towards linking this with abolishing IHT. Bit more joined up than the Spelman response isn't it? All good stuff (from CCHQ) apart from the objection to the bin tax - why? Because people would dump rubbish in neighbours bins. You might be fortunate enough to have somewhere to keep your bins at the back of the house, if you are even more fortunate you might have totally honest neighbours. Plenty of people have neither. I've lived in inner city areas for six or seven years-trust me it wouldn't work. Andrew Woodman - they should not be allowed to come in except during a specified period before each periodic re-valuation - improvements etc between valuations should not result in a change. When they do they should be required to make an appointment at least a fortnight in advance. You can't expect a tax based on valuation not to involve the right to inspect the property, although on grounds of economy presumably they would need to inspect only a small minority. Cornstock, the problem of dumping your rubbish in other people's bins was solved years ago - gravity lock bins: you have a key or swipecard to unlock your bin and put your rubbish in it; it locks when you close the lid; the only other way to open is to turn it upside down - so the binmen can actually take your waste away. People do realise that most of the rest of Europe charges for household waste in some form, right? Do they have a problem with fly-tipping? No. Do they have a problem with neighbours dumping their waste in each others bins? No. Is there something so wildly different about us? Londoner, I don't see why any government officer should be allowed in my home to carry out inspections. It is big brother government at it's worst. How much will these inspectors be on I wonder. There seem to be a lot of closet socialists on this site, the champagne type of course just like their leader. This whole thing is a scam so that central or local thieves can steal our property, bought by us with our taxed earnings, it IS OURS, keep you sticky thieving fingers off. One complaint about the third world countries is that they have no property law protection, it seems that from now on neither will we. Welcome to the third world, England. Derek B, if we accept that governments have to raise some money in tax, it can choose between taxing INCOMES (or turnover or profits, same thing) which damages economy, or it can raise money by USER CHARGES. As the bulk of the value of your land is largely a function of the VALUE of local services (not the cost thereof - e.g. restricting planning permission costs nothing but increases value of your land) it only seems fair to levy a tax on this value (you get what you pay for) rather than raising taxes from income. Land Value Tax at 1% of land values would be enough to replace council tax, inheritance tax and Stamp Duty Land Tax. Simple, fair, economically efficient. Some mistake surely; I've got quite a nice bit of land that I could easily build a half-dozen houses on - but it's in a 'conservation area' and I can't get planning permission - this means I can't actually realise the land's full potential value. David Boothroyd: "Does the Conservative Party believe that the level of council tax should continue to be based on the relative value of homes on 1st March 1991, for ever and ever and never be revalued?" No. We agree with regular revaluations, but we don't believe that they will be revenue neutral. In Wales, we were promised that the revaluation would be budget-neutral and that as many properties would move down a band as would move up one. Instead 30% of properties have moved up one or more bands but only 8% moved down a band. Almost as many properties have moved up 2 or more bands as were moved down at all. The reason the Welsh revaluation was not revenue neutral is that it was a cockup: the bands were set before the revalutation. The English revaluation was never going to be done like that; instead the values were going to be worked out, and then the bands set precisely so that it was revenue-neutral. Channel 4 News 'Factcheck' makes this point frequently when Tories try to pretend that revaluation is some kind of attempt to increase the tax take. Why not scrap Council Tax benefit and cut the tax with the money saved. Then perhaps it needs to move away from basing things on notional value of property towards the area of the land and more Local Government services need to be funded directly - waste disposal services could be billed directly and people could be charged fees for library membership and deposits for taking out books, all Education and Leisure Centre subsidies could be abolished. Cut down on numbers of councillors as well. Of course if what is wanted is simply to continue with the current system and have regular revaluations why not set it in statute to be at regular fixed intervals. Tanuki - I could have been more precise and said "restricting planning permission enhances the value of the RESIDENTIAL land ON WHICH YOUR HOUSE SITS". I'm disappointed in our response. Whatever happenned to localism? We should be about allowing Councils to set lots of different taxes and charges on lots of different things at lots of different rates - its' called choice and competition and it lowers taxes. Bin tax - yes please. Wheelie bins with microchips and little lock which only you and the bin lorry can release, which get weighed when they go on the truck. Fine by me. Local business rates, yes. Preferably hypothecated for specific local projects so everybody can see what they are paying and what for. London First think we could fund CrossRail from something like this. Local planning gain supplement - not Grumpy's national land tax - works for me. Specific charges for specific new infrastructure required to support new development, worked out locally, implemented locally. Supplemental Business Rates - see above, but we already have these, they're called Business Improvement Districts and they have one fantastic advantage - businesses, normally disadvantaged and disenfranchised, get A VOTE! Revaluation - well it is really a bit daft that a local property charge based on value hasn't taken account of something like the Jubilee Line Extension! Of course, if you do the stuff above, then the property charge is less important, but we can do better than a simple re-vaulation, many ideas alluded to above, most work. The thing to remember is you absolutely cannot replace Council Tax with another one-trick-pony. If we really are on the agenda I hear from so many Con Home posters when it is to do with anything other than local taxation - education vouchers anybody? Thought so - then not to support a radical reversal of centralisation of tax raising and local accountability is simply perverse.